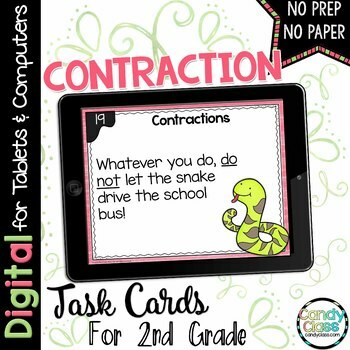 These contraction digital task cards covering contractions are ideal for grammar centers or other station work. 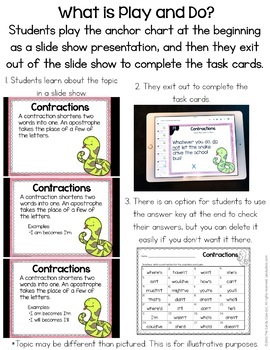 With this particular task card set for contractions, students will select the contractions to complete the sentences. 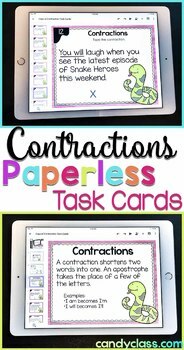 Additionally, this contractions resource is no prep and ready to use! If using with Google™ Classroom, you can use them completely paperless! If you do not have Google Classroom, there are also alternative sets of the task cards to run as a presentation and use with a no prep recording sheet. This option makes these accessible for anyone who has access to Google Drive and Google Slides, which are free! This option is not completely paperless, but it cuts out laminating and cutting! Did I also mention it can be used on tablets, iPads, and other mobile devices? Say what? Yup, you can use this on a tablet, computer, or you can even project them with a SMARTboard! In fact, this actual set, you could just use a projector on a normal white board, so no interactive whiteboard needed! Simply let the students use a dry erase marker on the board if you don't have access to an interactive whiteboard. Of course, that is just one of the options. These can be used simply with just a computer or tablet because they are very versatile! Not only that, but this resource stands out from simple apps on tablets because it automatically saves their work when you use the option for Google Classroom use. That means you have access to assess their work! Use for whole instruction, as center activities, for intervention or extra practice, in small groups, or in small groups. Find these digital task cards with others that together cover all the CCSS for second grade in the Language Digital Task Cards Mega Bundle for 2nd Grade Google Classroom Use. Click here to check out the Language Digital Task Card Mega Bundle for 2nd Grade Google Classroom Use. Please view the preview for more details about this resource. For more details about this resource, please view the preview by clicking on the button under the picture that says preview. It breaks everything down more clearly. If you are having trouble viewing the preview, feel free to contact me at teachcandyclass@gmail.com. I will be glad to send you a copy of the preview. Please note, this resource is for personal, classroom use only. Also, I am not affiliated or associated with Google, nor do they endorse this resource. 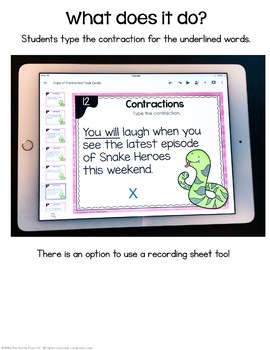 This resource for phonics is simply a resource that can be used with their software/apps. Thank you so much for stopping by the Candy Class!